Hanamichi : Kabuki Costume Presentation by Shochiku Costume Co. Ltd.
Kabuki Costume Presentation by Shochiku Costume Co. Ltd.
On July 30th, a kabuki costume presentation was held at the Portland Japanese Garden in conjunction with two days of performances by members of Shochiku Grand Kabuki. 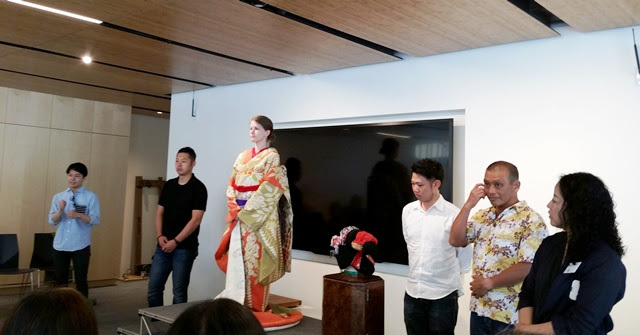 The performances and presentation kicked off the Kabuki: A Revolution in Color and Design exhibition which ran July 29th through September 3rd. 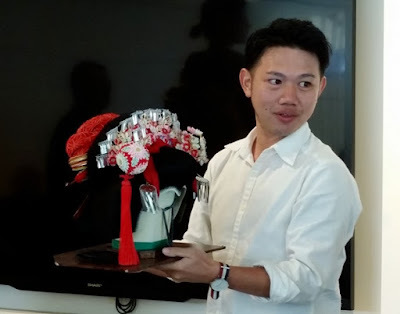 Mr. Hojo and Mr. Takemura are professional costume dressers with Shochiku Costume Co. Ltd. Mr. Hojo assists with costuming for different types of theater and Mr. Takemura only assists with kabuki costuming. Costumers must have ten years of experience before assisting high-ranking kabuki actors. Costumers assisting lower ranking actors must have at least two years of experience. A production with eighty actors on stage will typically have at least sixty people assisting backstage. 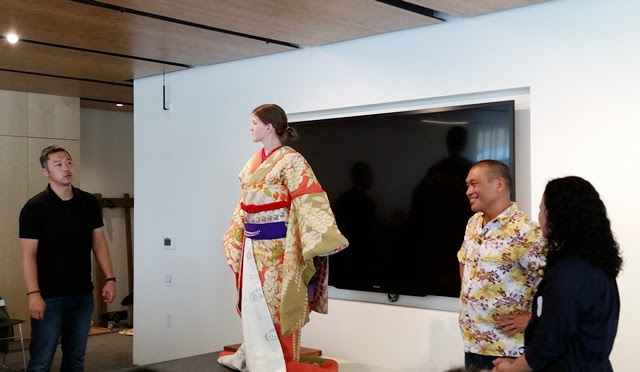 For this presentation, Mr. Hojo and Mr. Takemura dressed a young woman in the costume for the title role of the famous kabuki dance, Fuji Musume (Wisteria Maiden). This particular costume weighs approximately twenty pounds and is seventy to eighty years old. The kimono undergarments are silk in places that will be visible while non-visible parts are typically cotton. Tabi (white socks) are worn first, followed by padding to prevent the costume from shifting while the actor moves. An underskirt is added, followed by a han-juban, an undershirt with a collar that will be visible. The back collar of the han-juban is pulled low to avoid touching the hair on the wig. 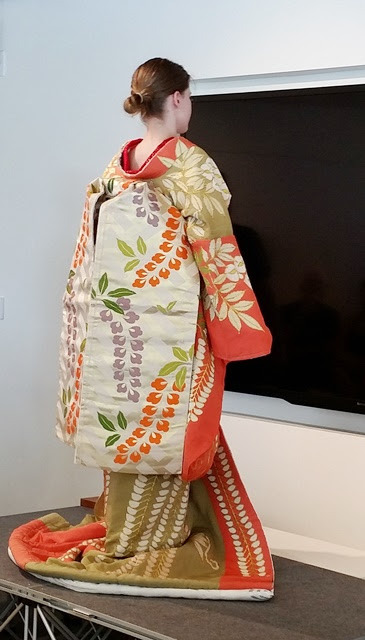 The kimono is tied into place with koshi himo (flat strings), followed by the obi. Both kimono and obi are in two pieces because this dance includes hikinuki (onstage quick change). Finally, the obijime (decorative rope-like sash) and obiage (decorative wide sash) are tied into place. Kabuki costume designs have remained the same for approximately one hundred years. Prior to that, the designs varied. Variances in costume color and accessories are a result of a discussion with the actor. If the actor prefers a deeper shade of green, the costume will have the same design with deeper colors. Preparing kimono for a role can amount to two months of work. The kimono will be dyed, then temporarily sewed. The design is drawn on and embroidered followed by the final sewing. Since the same kimono will be worn by different actors, it will be disassembled and resewed for the current actor's size. After a production, the costume goes to a special dry cleaner. Unlike traditional kimono, old kabuki kimono are not sold after they are retired. Instead, they are stored as samples or occasionally kept by an actor if they have a sentimental attachment. The costumes in this exhibition are still in use. The tokoyama (wig master) brought out the wig for Tenaraiko. He explained that youthful roles like that of the maiden in Tenaraiko require a bigger wig with more hair. The hair ornaments were pink and red for the role of a young girl. In kabuki, one wig master will be assigned to support the principal actor while another wig master will be assigned to support twenty to thirty actors in lower roles. Copper frames molded to fit each actor are kept on hand. If someone can't go out, the wig master can style a wig for the replacement actor within two to three hours. The frame can also be adjusted if the actor's hair volume changes. Nakamura Umemaru came forward to provide an actor's perspective on wearing kabuki costumes. He began studying dance at the age of seven and his first appearance on stage was at the age of eight. Kabuki actors rarely retire and Umemaru's teacher is active on stage at the age of seventy one.